A golf cart is very helpful on the green, but you still need to have a quality cart bag like the EX-250 from RJ Sports. It is a simple fabric and nylon bag that will serve you for a long time due to the quality of these materials. Apart from this, it has 14 full-length dividers that make it easy to arrange your clubs and also to store and retrieve them. Although it has only seven pockets, they are more than enough for most golfers. And you also don't have to worry about rainy conditions because it comes with a rain hood. A golf cart is very helpful on the green, but you still need to have a quality cart bag like the EX-250 from RJ Sports. It is a simple fabric and nylon bag that will serve you for a long time due to the quality of these materials. Apart from this, it has 14 full-length dividers that make it easy to arrange your clubs and also to store and retrieve them. Although it has only seven pockets, they are more than enough for most golfers. And you also don’t have to worry about rainy conditions because it comes with a rain hood. Material: The Ex-250 is a fabric and nylon cart bag, and this makes it a very durable bag and also gives it an attractive appearance. 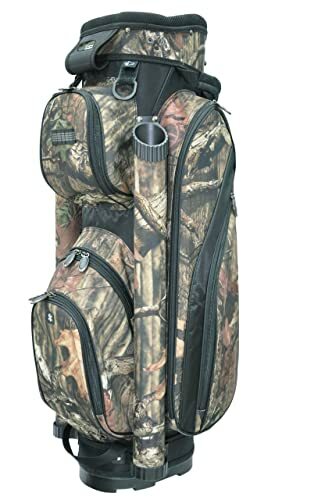 Dividers: This bag has a 14 way divided top, and this makes it easy for you to store and retrieve your clubs and it also makes them look organized when in the bag. Pockets: It has a total of seven pockets that you can access easily even when the bag is on a cart. However, only three of these bags are for balls and accessories. Rain Hood: The rain hood is one of the most important things that you need for your golf bag, and this one comes with a matching one for protection under severe weather. Beverage Compartment: The beverage compartment is insulated, and this ensures that you get to enjoy your drinks at their initial temperature. Extras: It has two oversize tubes for your putters, and this means that you will not need to carry any other bag since it can accommodate all your essentials. Weight: It only weighs 7.5 pounds making it one of the lightest golf bags one the market. It is affordable, and it will also give you value for your money. Even when it is not in the cart, it will stand up without having to lean on anything. This bag is lightweight, and so you will have an easy time moving it around the green. Club dividers are very sturdy, and so you can easily slip in clubs and take them out. The nicely padded shoulder strap makes it comfortable to carry when you do not feel like pushing it on a cart. Ex-250 has a durable nylon and fabric material and so you can be sure that it will serve you for long enough. The ball pocket is smaller than what you find in other modern bags. Although the integrated cart strap is beneficial, it covers the pockets when the bag is on a cart. This bag will shift all around when you put it in your cart because it does not have any retaining mechanism. It only has three pockets for your accessories and balls which are fewer than most other cart bags. The EX-250 from RJ Sports is not entirely flawless, but the fact is that you will not find anything better than it at that price. However, it does not have any issues with quality because most golfers only complain about minor things such as slow response to customer queries. This bag sits well on your cart, and it also has enough storage space to carry all your essential golfing gear. All in all, this is one of the best golf bags that will make mobility on the course easy for you and you will also not have to spend a lot of money to get it.